and was found to have X of them. What does that mean? Will he or she get type-1, and if so, when? I know this slide is a dense with information, so I discuss it below. Survival Distribution Function is a (very poor) way of saying "% of people who don't have type-1". Strata refers to the number of autoantibodies detected. Basically, each line above represents a group of people with a different number of autoantibodies. The top line represents people with zero autoantibodies when first tested, the second line from the top represents the group of people who had one autoantibody when first tested, and so on. When first tested, none of the people in the group had been diagnosed with type-1 diabetes, so all the lines start at 1.0, meaning that zero percentage of the people in the group had type-1 diabetes. However, as time progresses, some of the people in the group are diagnosed with type-1 diabetes, and so the lines drop as that happens. So 0.8 on the left side means 20% of the group has type-1 diabetes. As time passes, the lines move from left to right, so you can see on the bottom as one year goes by, two years etec. Because of the small number of patients, and odd behaviors out at 8 years, I don't think I would use the 8 year data, but you can see how things change from 0 to 7 years. Let's assume that your child does not have type-1 diabetes, but tested positive for 1 autoantibody. That is the solid purple line. If your child is statistically average, then the chance that he or she will be diagnosed with type-1 diabetes after two years is very small. Eyeballing the purple line at 2 years, it looks like it is maybe at 0.97; so the chance is 3%. Even if you look out to 7 years, the line looks to me to be around 0.9, so that means a 10% chance after 7 years. First, no one can tell you if your child is going to get type-1 diabetes or not, and no one can tell you when it will happen. This data is all about the percentage chance that someone will be diagnosed. Second, in my opinion, this is the best data available, certainly for people who live in the USA. However, it is only one study, and it would be nice to compare it to data from other studies, and especially from other countries. This slide reports on almost 25,000 people, and the study is constantly enrolling more people, and will report on them in future years. Third, the numbers shown above are what happens naturally, without any attempt to prevent type-1 diabetes. 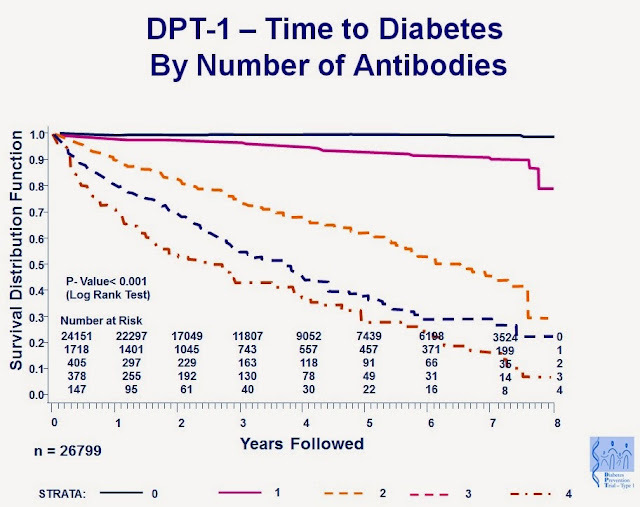 So therefore, if researchers claim a treatment prevents type-1, they must provide data better than the data shown above. For example, if someone tells you, "My kid had all 4 autoantibodies, but I gave the drug X (or holistic, all natural, superfood Y), for a year, and that prevented their type-1 diabetes". Then you can look on the table above, and see that only 30% of 4 autoantibody patients were diagnosed in the first year, just by chance. So drug X or superfood Y should not be getting credit as a prevention. Fourth, more generally, this data shows the importance of testing preventative treatments on large groups of people. In one sense, not having type-1 diabetes is the normal situation, even people who have many autoantibodies. If you follow them for a year or two, most will not get type-1 diabetes. Statements like "Given drug Z, even people who had 3 and 4 autoantibodies did not come down with type-1 in the year they took it" are meaningless, because even without drug Z, most people would not be diagnosed in that time period. I consider this a very important posting, because I know that some people are very scared and nervous after they find out how many autoantibodies their children have. I want to encourage people to repost this blog entry, tweet it's URL, include it in newsletters, and generally to redistribute it (with credit, and in it's entirety) to anyone and in any way. The question of "what do autoantibody counts actually mean", has been vexing us for years, and I think the slide above is the best answer I've ever seen. I want to particularly thank the researcher who presented this slide, and also TrialNet, for collecting the data. All the views expressed here are those of Joshua Levy, and nothing here is official JDRF, JDCA, or Tidepool news, views, policies or opinions. My daughter has type-1 diabetes and participates in clinical trials, which might be discussed here. My blog contains a more complete non-conflict of interest statement. Thanks to everyone who helps with the blog. Thank you for posting this. I was diagnosed with type 1 at 23 and have had it for 5 years now, I would like to have my 5 year old tested for antibodies-do you know generally, if doctors will test for antibodies if you ask them? or do you have to jump through hoops to get them to run this test.